Welcome to Lockforce Northamptonshire, operated by Gavyn Palmer, who has been elected as our franchise's trusted representative in the Northamptonshire area. Gavyn has a wealth of experience in servicing both domestic and car lock systems and is available 24hours a day to answer your call. Good quality locksmiths are few and far between. However, when calling Lockforce Northants, you can rest assured that you have contracted the services of an experienced and dedicated lock professional, whose expertise will help resolve whatever lock problem with which you are blighted. When car locks fail, it's easy to feel vulnerable! However, when you contact Lockforce Northamptonshire, you can be sure that you are taking on a real expert in the field. 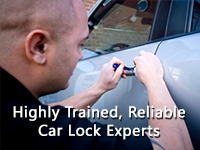 All our locksmiths have undergone rigorous car lock training before they are allowed to operate under the national Lockforce brand and we are keen to apply his schooled expertise to your specific car lock problem. We are highly trained in cutting new keys, decommissioning old ones and opening car doors with minimal damage to your vehicle. Over the years, we at Lockforce Northampton have come to learn that the majority of lock emergencies tend to happen at the most inconvenient times for our clients. That's why we operate a 24 hour emergency response service. Whether you are locked out of your house or car, have lost your keys or desperately need a new replacement, our regional representative Gavyn is on hand to help…day or night. Call now to speak with Gavyn today! When calling our hotline, you will be greeted with a friendly and informative operator, who will connect you to the relevant nearby locksmith. It's an inconvenient truth that there a regrettably few locksmiths who are as adept at automatic locks as they are at servicing traditional domestic varieties. However, this is not the case when you hire the services of our multi-talented locksmiths. All of our technicians are highly knowledgeable can fit, upgrade, recommend, cut and disable the entire gamut of automatic locks available on he retail market. For an locksmith with expertise in car autolock technology, call us today. This includes Northamptonshire Car Locksmith services such as car key replacement, car key cutting or emergency entry to your vehicle without damaging it. Locked out in Northamptonshireshire? Never fear, for our network of highly trained locksmiths are littered across the county to ensure that wherever you find yourself locked out, we will be able to come to your assistance. We endeavour to respond rapidly to each emergency call out, and our heavy investment in non-destructive lock techniques ensures that in 90% of cases, we don't even have to break a lock!